Splashtop OS is a light-weight linux based operating system from Splashtop Inc. Splashtop OS is generally installed along with Windows. This means that when users wants to just browse the internet, chat or listen to music they do not have to wait for Windows to start - instead they can get to Splashtop OS instantly and get on with their works. Splashtop OS has been available for quite some time - but only from OEMs. Major manufacturers such as HP, Dell, ASUS etc. have released laptops and netbooks with Splashtop OS pre-installed along with Windows 7. However, Splashtop Inc. has announced that Splashtop OS is no longer restricted to only OEMs. The latest version of Splashtop OS - version 1.0 - is now available for download so that anyone can install it. Unlike the previous versions of Splashtop OS, the new version which is available for download is based entirely on the Chromium browser. 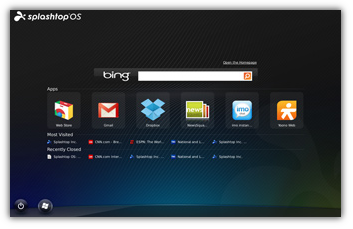 Splashtop OS have native applications, apart from Chromium browser, and it boots directly into the browser. Users can however still install web apps from the Chrome Web Store. Splashtop OS 1.0 is now available for download from their website. It supports most of the major laptops and netbooks. Installation is quite simple and has to be done from Windows. The Splashtop OS boot menu will allow users to choose which one - Slpashtop OS or Windows - to start on boot.